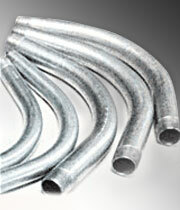 Columbia-MBF™ offers superior coatings and a patented flo-coat process that has left imprint on the tubing industry. 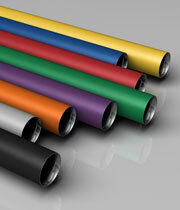 Columbia-MBF™ provides E-Z Pull® EMT conduit as well as E-Z Pull® EMT in True Color™ and Kwik-Fit® options. Along with conduit, Columbia-MBF™ also produces EMT elbows made out of our precision manufactured EMT conduit with the E-Z Pull® coating. Columbia-MBF™ E-Z Pull® Conduit made with our superior E-Z Pull® interior coating simplifies wire pulling and delivers exceptional security for your conductors and cables. With the traditional wall thickness of EMT and the strength of steel, Columbia-MBF™’s EMT conduit and elbows produce an Electrical Raceway solution accepted as an equipment grounding conductor. EMT conduit is a raceway answer which allows for future wiring changes and offers tremendous mechanical protection to conductors and cables. EMT provides EMI shielding and is 100% recyclable. Columbia-MBF™’s mission is to be a market leader in delivering results and more options for customers. With a constant commitment to deliver innovative solutions to customers, Columbia-MBF™ developed Kwik-Fit® and Kwik Compression EMT: labor savings alternatives with an integral coupling on one end. In addition, Columbia-MBF™ established the line of True Color™ EMT for simplicity of circuit identification in the field. In our quest to provide top-notch service and value-add to customers, our EMT is stocked at distribution centers across the country. Our EMT conduit and EMT elbows are part of the Atkore Electrical Raceway portfolio of products and can be co-loaded with many of our other Columbia-MBF™ and Atkore Electrical Raceway Products. For a complete list of our EMT products please browse our offerings and experience the countless advantages of E-Z Pull® EMT, EMT Elbows, True Color™ EMT, Kwik-Fit® Set Screw, and Kwik-Fit® Compression products. True Color EMT's is available in 8 vibrant colors to provide instant identification of multiple circuit systems. Quality electrical metallic tubing with the E-Z Pull interior coating. Hot galvanized steel using patented inline Flo-Coat process for long lasting exterior protection. Kwik-Fit EMT is manufactured from high quality steel with a built-in set-screw coupling, eliminating the need to purchase inventory, and install separate couplings. All the benefits of E-Z Pull EMT with an integrated coupling. This significantly reduces installation time, and eliminates the need to purchase inventory, and install separate couplings. 90 and 45 degree EMT elbows are made from hot galvanized steel using patented inline Flo-Coat process and E-Z Pull interior coating.